What is GIA? Changes in ice loading during the last hundred thousand years or so, and particularly since the Last Glacial Maximum (LGM), combined with the mantle’s relatively high viscosity, produce ongoing deformation within the solid earth as it seeks gravitational equilibrium – that basically means that the more ice that is on top of the crust, the more the crust around it deforms. Because the density of the solid earth is approximately three-times greater than ice, 3 km of ice deforms the crust by about 1km. When ice melts, the crust slowly moves back up and this creates a mass (and hence gravity) trend for many thousands of years. Subtracting the GIA signal from GRACE data would not be a problem if we knew exactly the history of the evolution of the ice sheets and the rheology and spatially varying structure of the solid Earth. However, we don’t. The greatest impediment is the uncertainty in reconstructing the post-LGM Antarctic ice sheet. Unlike the formerly-glaciated parts of the Northern Hemisphere, 98% of Antarctic bedrock remains covered by ice and the ice sheet periphery is covered by extensive ice shelves; together these introduce substantial uncertainty in reconstructions. Indeed, previous estimates of the extra volume of Antarctic ice at LGM, compared to present-day, ranging from 3 to >30m of equivalent sea level (Bentley, 2010). Previous models of GIA, based on ice sheet history constraints such as the ICE-5G reconstruction, have implied that corrections to the GRACE-derived ice mass loss around 100-200 Gt/yr are required, which is large compared to the expected present-day rate of ice-mass change. Over the last ten years, there has however been a big increase in field measurements that provide more constraints on both the ice history and present-day bedrock uplift, particularly in West Antarctica. For instance, constraints on LGM ice extent and elevation have been obtained based on new geomorphological mapping combined with cosmogenic isotope dating of boulders left behind as the ice sheet retreated. These data consistently show that the LGM volume of West Antarctica was much less than previous data suggested and less than that were used in ICE-5G. In East Antarctica, ice core data show increased accumulation following the LGM until the last few thousand years. The long time required to discharge this extra snow means much of the East Antarctic ice sheet must be thicker now than at LGM, with the exception being the coastal perimeter where retreat of the ice edge was widespread. In our paper, we used our own ice-sheet reconstruction for the GIA correction (Whitehouse et al., 2012a; 2012b). It is based on a numerical ice sheet model, tuned to fit the new geological data, and estimates the post-LGM Antarctic contribution to sea level of ~8m – near the lowest estimates previously published (Bentley, 2010). The resulting GIA model (called W12a) shows much lower rates of uplift in West Antarctica than previous models. In East Antarctica it shows inland subsidence and coastal uplift. These results can be tested directly against global positioning system (GPS) measurements of how the Antarctic bedrock is moving vertically. The spatial distribution of sites is limited at present – because they need to placed directly on rocky outcrops – and there are only a few such sites in East Antarctica. 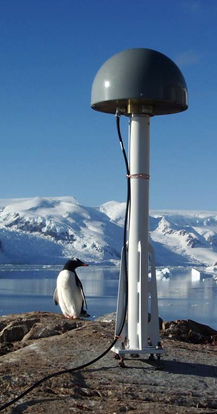 In addition, some of the West Antarctic GPS records are campaign-based rather than continuous and hence are less precise than we would like – although this is being tackled through the POLENET programme. Nevertheless, GPS sites have systematically lower rates of uplift than previously predicted and our new GIA model (W12a) has much closer agreement than other models (King et al, 2012). So how does applying W12a affect estimates of ice mass change? The GRACE observations over Antarctica suggest a near-zero change in the combination of ice and solid earth mass redistribution; the magnitude of our GIA correction is substantially smaller than previous models have suggested and hence we produce a systematically lower estimate of ice mass change from GRACE data: we estimate that Antarctica is losing 69±18 Gigatonnes per year (Gt/yr) into the oceans over 2002-2010 – equivalent to +0.19mm/yr globally-averaged sea level change, or about 6% of the sea-level change during that period. Our result still falls within the range of estimates produced from the other two independent techniques outlined above, but is distinctly toward the lower end of the mass-loss range. Our estimate is about half to a third of the most recent estimates based on GRACE data (Velicogna, 2009; Chen et al, 2009. West Antarctica appears to be losing mass about twice as fast, but this is partially offset by East Antarctic ice sheet accumulation. Despite the better fit to observations in the GIA model, significant uncertainties remain. We used an ensemble of ice sheet model runs and plausible Earth models to place bounded constraints on our mass change estimate. The East Antarctic rate of growth spans +7 to +89 Gt/yr – ranging between being effectively in balance to growing substantially. We need further field data from key areas of East Antarctica to reject some of the ice model scenarios – although there are fewer rock outcrops to sample geologically and geodetically in this region, there are still large regions where no, or few, data have been collected and/or results have been published. The bounds in West Antarctica (loss of between 128 and 103 Gt/yr) reflect a much smaller GIA uncertainty together with a much small surface area. Substantial ice sheet changes that occurred during the last hundreds to few thousands of years remain poorly quantified and are not included in our model. These may be particularly important in parts of West Antarctica, and particularly the Antarctic Peninsula, where mantle viscosity is estimated to be lower and hence more responsive to recent fluctuations in ice volume (Nield et al, 2012). GRACE data are still being collected but the mission has now begun to rundown. With a much-needed GRACE follow-on mission expected to launch around 2017, observation and modelling of the Antarctic GIA will continue to give us insights into the ice sheet history – from LGM through to the present – and hence provide the context for any future changes. Satellite images indicate Earth’s cryospher occupies > 10% of its surface , or some fifty million square kilometers. But that tenth of the planet’s area has an albodo typically in the 60-85% range, making it locally three to five times more reflective than the continental average , and an order of magnitude brighter than the oceans , and amplifies the radiative impact of ice recession at the cryosphere margins accordingly. Just to check, the acceleration of about -14 Gt/yr/yr found be Rignot et al. (2011) for Antarctica is not in question here, just when the mass balance changed sign? Just for reference, we went over some of this ground here last year, discussing Rignot 2011 (and Wu 2010). Very interesting. If my quick search is correct, this paper’s result is roughly comparable to Greenlandic mass loss rates, right? And this should be susceptible to meaningful consideration within the context of SLR measurements/modeling. Does this lower estimate of Antarctic contribution to sea level rise (from melt) indicate that the thermosteric component (expansion from warming) is larger than previously estimated? That more energy is going into the oceans, more warming, than previous calculations indicated? Interesting. Many of the drainage basins in West Antarctica and the Peninsula are quite small. If memory serves, GRACE’s spatial resolution is about 400 km. How were these small basins mapped? In 15 years, when we have data from the GRACE follow on systems, what do you expect to find? How fast can WAIS/EAIS loss/gain change given current weather patterns? Thanks much for this article and the references provided by everybody. As you know, the denialists say that ice loss in the Arctic Ocean is matched by ice gain in the “Antarctic Ocean.” This article will be good as a reference to help dispel that nonsense. What is expected in long term trends? To my understanding, a thaw during deglaciation is typical on earth with a see-saw effect (North/South hemisphere) as for example it happened during the Younger Dryas or can we calculate a more broader, global time frame for the ongoing deglaciation? I assume that the rate of emissions to past emission uptake and following deglaciation is about 300 times faster than in historical records. KR (#5) our results don’t speak to the origins of the very high sea level rise rates in this period other than to suggest this rate was achieved with little input from Antarctica as a whole. One recent compilation by Church et al. in GRL gave 0.43 ± 0.20 mm/yr from Antarctica (1 sigma uncertainties) so our rate is systematically lower but not outside 2 sigma uncertainties. Chris (#2), CM (#6), Dan H (#7) just note our sigmas in the paper are reported at 2 sigma throughout. We find the only basin to be seeing *overall* acceleration (at 2 sigma) to be the one containing Pine Is Glacier on the Amundsen Sea Coast of West Antarctica. The reason for the differences in estimated *acceleration* between our study and previous GRACE ones needs further examination but the accelerations seem somewhat sensitive to data period (since the changes are not a perfect quadratic) and how we derive data uncertainties. It’s important to say that satellite altimetry has identified the neighbouring Thwaites Glacier to be accelerating at its front but this is either in the noise of our GRACE results or countered by accelerating snow accumulation higher up in the Thwaites Glacier basin (http://dx.doi.org/10.3189/2012JoG11J118). Bill S (#9) – you are right about the resolution of GRACE – but these basins are generally much larger than 400km across. We needed to consider carefully leakage of signal from one basin to the other carefully. Edwards (#11) don’t get confused between Arctic sea ice and grounded Antarctic ice. I think the denialists are comparing sea ice with sea ice. Does Also Sprach Zarathustra start blaring out when a penguin gets close to that thing . . . Thanks for your response. Regarding the rapidly-moving Thwaites glacier, what do we know about the long-term changes in its movement? Can you answer this in light of the large scale advance and retreat over the past 30 years. Thanks for your explanation. Interesting that when taking your rate and acceleration and extrapolating back to when the mass balance was zero, and doing the same with the Rignot et al. GRACE date, you have a higher contribution to sea level by about 2% up to 2010. Your rate is slower, but you are adding to sea level for a longer time, 21 years rather than 11 years. All in the noise of course. I was just reading about the antipodal bulge that showed up in the Mars Laser Altimetry experiments opposite the 3 klick thick Tharsis Volcanic Provence…..and, I wonder, if a certain amount of data could not also be extrapolated from observations of the abysal plains beneath the Arctic Ocean. Probably not…but, hey, if Canada were antipodal to Antarctica, maybe we’d be in business? This article might belong on unforced variations, moderators please move it if appropriate. Apparently there is a faster than centennial coupling between polar climate and ice volume, last 4 episodes of rapid polar deglaciation/warming all resulted in 1.2 m/century. Hansen, as we know has opined that ice mass waste can be much quicker than gain, this is evidence for that view. Dan H. (#17) – I don’t have my finger on the pulse of published work, if any exists, on multi-decadal changes for Thwaites. There is certainly a growing body on Pine Island Glacier. Chris Dudley (#18) – Maybe I missed your point, but I think you attributed the duration of the Rignot result to us – we cover 2002-2010 (to round figures) – about 8.5 years. Our rates apply to 2006.9 (in decimal years) so you need to apply any acceleration relative to that time. Chris (#18) – I may have missed your point but I think you attributed the Rignot time-period to our study. Our data span 2002-2010 to round figures (about 8.5 years centred on 2006.9). If you wish to apply the accelerations you need to do that relative to rate reference epoch of 2006.9. > over the past 30 years. What? a large scale advance? Authors: Macgregor, Joseph A.; Catania, Ginny A.; Markowski, Michael S.; Andrews, Alan G.
Rignot et al. used two methods, a mass balance method and their treatment of the GRACE data. I used their GRACE data fit from fig. 2b estimating their rate at 2006 as -100 Gt/yr and reading their acceleration off the figure as -13.2 Gt/yr/yr. For your work I took -69 Gt/yr and -4 Gt/yr/yr from this article and the comments. Looked like the same data period was used in both works. Thus the epoch would be the same. I did add 4 years to the epoch rather than 3.1 to get to 2010, but that change would just favor your analysis as giving a larger contribution to sea level rise. Going back just to when Antarctica tipped into ice mass loss is a little arbitrary since it may have retarded sea level rise earlier, it is just amusing that things happened to come out so close. Can somebody please point me to a good read about general Deglaciation science – from a global perspective, or are there only studies looking at isolated events and the ice cores who show a balanced climate cycle (temps/Co2 levels)? prokaryotes @26 — Using a web search engine using the phrase general Deglaciation science produces lots and lots of entries, including at least one book and the following review. David, but is there some science available for free and from the last 1-3 years? I googled “deglaciation” and besides single events, i cannot find a place for a greater look. So for now i guess i have to stick with study papers and different events. Maybe somebody else has another tip for me, thanks. On the bottom line i ask public, because others might be interested as well and maybe my comment above motivates to improve the wikipedia page for deglaciation. Cheers. Prokaryotes, from a modeling perspective, a few studies come to mind. I have not yet read it, but it seems to be cutting edge dating of high-res paleo data. Given that the previous study by Rohling et al (2008) was used as a basis for the H++ scenario of UKCP of 2.5 meter SLR for year 2100 (Lowe et al 2009), this new study could be very important. That’s your search term in Google Scholar, using the “since 2008” button on the left side of the results page. After that it’s up to you to dig in — try the “More” button; often you’ll get a HTML page or a link to a library that has it available, or a list of various copies; often one is free from an author’s web page. Reposted yet once more again as new readers may not be aware that they can get free copies of most recent science papers — by looking.